Usually you only have one browser profile that you use for everything - you have your passwords on it, save your tabs and bookmarks there and also pile up history and cookie data. If for some reason you want to divide some of this stuff between user profiles and use those with different command line arguments, Firefox let's you do exactly that. Before you proceed, take a look at the warnings on the Mozilla page - I had no issues with it however. 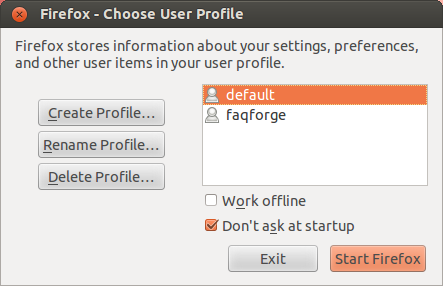 To ease profile selection, you can create multiple Firefox icons or symlink and assign them the appropriate command line arguments to open with.